How can you be off the grid and on the grid at the same time? By keeping a portable solar collector handy! Whether you trying to survive the fall of western civilization up in the mountains or just camping in a remote location, a Sierra Portable Solar Collector may just be the difference between survival or ending up Coyote chow. 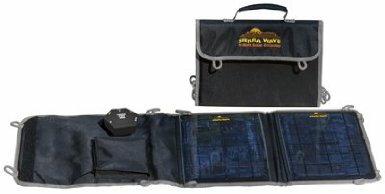 In the last few years the portable solar collector has come into its own and the Sierra range of collectors is leading the way in terms of portability, weight and charge power. Gone are the days when in order to enjoy some of the comforts of home you needed to tow a weighty, cumbersome generator along with you on extended camping trips. The Sierra range of state of the art portable solar collectors now replaces many of the utilities that a generator used to provide. We review three of the collectors. As far as portable solar collectors come this lightweight, compact collector meets all of your outdoor requirements. The Sierra 5 watt collector can generate solar power for a remarkable range of devices. It conveniently rolls up into a weatherproof nylon covering which protects the solar cells during transport. A multi-voltage power port hub that allows for 5V USB, 6V, and 15V power output options. Connect your 12V DC vehicle chargers to the collector. The power port hub allows power regulation protection to your devices. The Sierra 5 watt solar collector can directly charge many electronic devices such as cell phones and smart phones, MP3 players and iPods, GPS units, eReaders, Tablets and also iPads, flashlights, digital cameras and battery storage devices. This lightweight, high wattage portable solar collector packs some powerful charging capabilities, while still being easy to carry if you are trekking by foot. The Sierra 10 watt portable solar collector can generate solar power for a wide range of devices ensuring you never run out of battery power. It conveniently rolls up into a weatherproof nylon covering which protects the solar cells during transport. Connect your 12V DC vehicle charger to the solar collector. 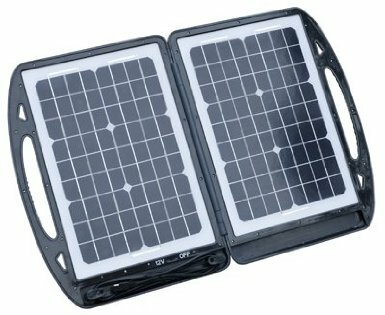 The Sierra 10 watt portable solar collector can directly charge many electronic devices such as cell phones and smart phones, MP3 players and iPods, GPS units, eReaders, Tablets and also iPads, flashlights, digital cameras and battery storage devices. This portable solar collector is seriously powerful, providing a full 80-watts solar power collecting performance. Designed for long term remote camping trips or true survivalist scenarios when you need to have all of your electronic devices at full power so that you will never lose communication capabilities and never lose lighting or heat. This high powered panel was designed to provide energy for the solar link 240 and can also provide full charge ups of 12V batteries and similar devices. Up to 2 of the 80-watt solar collector panels can be connected together for double the output. The device charge time varies from 5-6 hours using one panel, but with 2 panels connected, 3-4 hours.